Forget spring flowers, southeast Wisconsin is instead getting pelted with April snow showers, but Kevin Poltrock said he’s taking it all in stride. 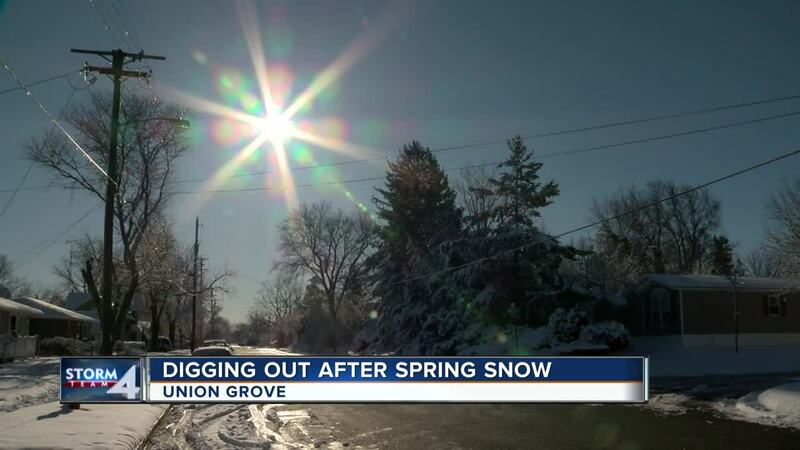 UNION GROVE — Forget spring flowers, southeast Wisconsin is instead getting pelted with April snow showers, but Kevin Poltrock said he’s taking it all in stride. “I used to live in northern Wisconsin and you get snow in May and you just live with it. It’s Wisconsin,” Poltrock said. Poltrock now lives in Union Grove, a village in Racine County that got the worst of Sunday's winter weather wrath with 9 inches. Other areas such as Greendale and Greenfield only saw 3. "It was 70 degrees a few days ago, and then the next week it’s back to snow,” Poltrock said. The National Weather Service reported sun and near-50-degree temperatures will be enough to knock a few inches off the snow, something Gary Stevens is looking forward to. He said he wants the sun to do the work so he can put his shovel down. “(The worst part is) having to get out here and shovel it, especially when you’re retired,” Stevens said. Spring-like weather is around the corner — and that includes rain — or as Stevens said, the kind of shower that might actually bring May flowers. “I’ll be glad when summer’s here,” Stevens said.